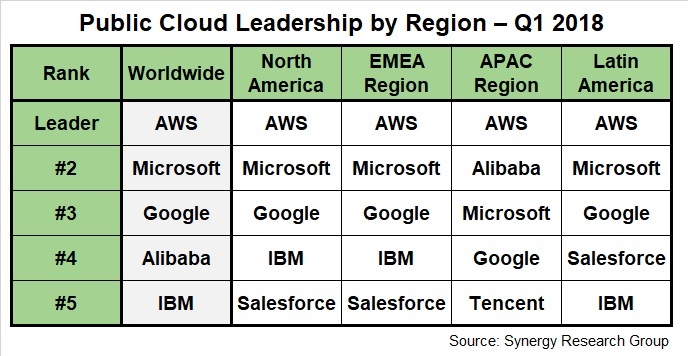 Amazon Web Services (AWS) remains the global public cloud market share leader followed by Microsoft Azure & Google Cloud Platform (GCP). Leadership varies by region. Alibaba, IBM, Salesforce & Tencent give chase . When it comes to public cloud services, Amazon Web Services (AWS) remains the global market share leader at 33 percent — followed by Microsoft Azure (13 percent) and Google Cloud Platform (6 percent), according to Synergy Research Group. Still, the market share race varies from region to region — with rivals like Alibaba, IBM, Salesforce and Tencent giving chase. Here’s how things shake out when you zero in on cloud services market in such areas as North America, EMEA (Europe, Middle East, Africa), APAC (Asia Pacific) and Latin America, according to Synergy Research Group’s Q1 2018 estimates. China-based Alibaba Cloud ranks among the companies to watch. Although not well-known in the United States, the company appears to be preparing moves in Europe. Chief among them: A potential Alibaba-BT partnership to reach European customers. Also, No. 5 global player IBM continues to drive growth — with annual “as a service” revenues hitting an $11.1 run rate during the company’s latest quarter. Still, it’s unclear if the technology giant is actually gaining “as a service” market share against AWS, Microsoft and Google. IBM market share has been relatively stable at around 8 percent, thanks primarily to its strong leadership in hosted private cloud services, Synergy Research Group indicated in Q1 2018. Good report, but it would be more meaningful if it segmented reporting with additional dimensions for: IaaS, PaaS, and AI and IoT specifically. Dan: Great points and thanks for the note. Generally speaking, I believe the list above focuses mainly on IaaS. I don’t know if/how it will be possible to measure AI momentum among the cloud providers — since AI is increasingly built into specific services rather than a standalone service that customers consume. Still, we’ll look around for more market share data points to share with our readers. A big factor for me on considering infrastructure is what kind of third-party monitoring services are available. I don’t trust CloudWatch to have my back further than I can throw it. My experience going from AWS to Google Cloud has been significant gains in performance for the same amount of money. Anyone else seen that? I hear that Google’s hardware is pretty beefy. They are more interested in taking over market share than they are with the bottom line at this point.